Today is the last day of Hanukkah, an 8 day festival that celebrates the rededication of the Temple in Jerusalem after Antiochus Epiphanes desecrated it in 168BC. The story of The Maccabees, who overthrew Antiochus Epiphanes, can be found in the extracanonical texts 1 & 2 Maccabees. What I want to look at is the New Testament application of biblical truths found in the Hanukkah story. Firstly let us see the man Jesus in John 10: It was now winter, and Jesus was in Jerusalem at the time of Hanukkah, the Festival of Dedication. He was walking in Solomon’s Colonnade when the Jews approached Him wanting to know if He was indeed the promised Messiah. Solomon’s Colonnade was a 3 aisled portico running along the eastern side of the gentile’s court. There are a number of points that strike me as I read this passage. Firstly, Jesus is walking along an intersectory point. He is not in the Court of the Gentiles ~ but he is not far away either. He is close by. This strikes me because in Jesus day the Gentiles had no real access to the God of the Israelites. They could only worship in the furthermost outer court. If Jesus had come in through The Golden Gate, he would have passed through Solomon’s Colonnade, then the court of the Gentiles, on his way to the court of the Israelites. As women, we would only have been a little better than the gentiles, with a separate place of worship. The 2nd thing that strikes me is that this takes place after a long monologue Jesus delivers on being the Good Shepherd. The Jews understood exactly what Jesus was saying. There was only one Good Shephard ~ Yahweh Ra`ah. Now we need to understand something about shepherds in Jesus day because we tend to think today shepherds are pretty weak & woosy. This is not what was understood by Jesus’ listeners. Remember Psalm 23, which these people knew, was written by a shepherd about a shepherd ~ & that shepherd was strong enough & brave enough to kill both a lion & a bear who threatened his sheep. On his own with little more than a slingshot & a club. Hosea 13:8 has this imagery about God: Like a bear whose cubs have been taken away, I will tear out your heart. I will devour you like a hungry lioness and mangle you like a wild animal. In effect Jesus is saying His shepherding is strong, protective, ferocious, brave as well as sacrificial. So the Jews want to know: Are you really the Messiah? How can you prove it? And Jesus tells them: The proof’s in the pudding! His miracles speak for themselves. They are His proof. However He also points out that they are not his sheep. There is always a clear distinction between God’s people & those who are not His. Paul puts it this way: The message of the cross is foolish to those who are headed for destruction! But we who are being saved know it is the very power of God. Interestingly John 10 is the only place Hanukkah is ever mentioned. It is never mentioned outside of the New Testament. Now I always tell people I am not a bible scholar. I am a Lit Major & so symbols speak very powerfully to me. Hanukkah is also known as The Festival of Lights so now I want to look at some of that symbolism. Symbolism works at a number of different levels, exposing layers of the prophetic. So when Christians celebrate the festivals they celebrate them in the fulfilment of their prophetic aspect, not always as the Jews do. John 8:12 ~ Again Jesus spoke to them, saying, “I am the light of the world. Whoever follows me will not walk in darkness, but will have the light of life. During Hanukkah a special nine branched candle bra is used. The festival is celebrated for 8 days because when the Jews reclaimed the Temple there was only enough holy oil to keep the Menorah in the Holy of Holies lit for 1 day. Miraculously it burnt for 8 days. Eight days is the time it took to prepare a new batch of Holy Oil. 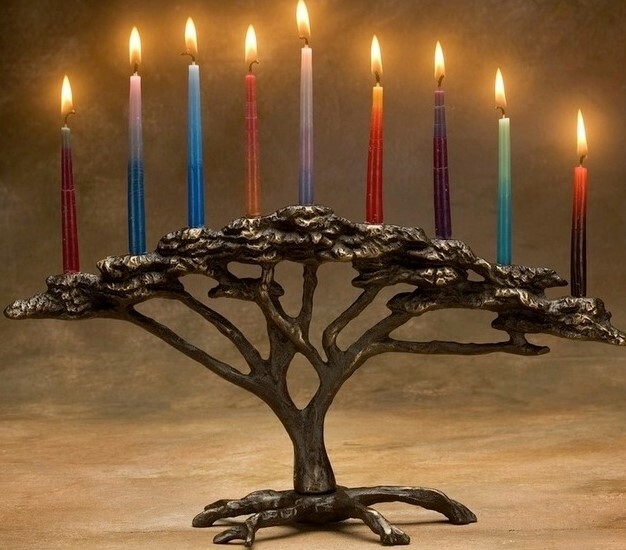 There are 8 candles to represent the 8 days of Hanukkah. The 9th candle is usually white. It is referred to as the shammash, or the servant candle & is used to light all the other candles. The shammash symbolises Jesus, the Light of the world. Each night of Hanakkuh a candle is lit. Day 1, one candle, day 2, two candles etc because in matters of holiness we should increase, not decrease. Hannukah is a fun festival & the candles of the menorah are usually coloured. The colours represent 8 different covenants God made with his people. 5: 14 “You are the light of the world—like a city on a hilltop that cannot be hidden.15 No one lights a lamp and then puts it under a basket. Instead, a lamp is placed on a stand, where it gives light to everyone in the house. 16 In the same way, let your good deeds shine out for all to see, so that everyone will praise your heavenly Father. Traditionally a menorah is interconnected. All the wick holders are fed from one source & pure olive oil is used. Oil is always a symbol for the Holy Spirit. We see from this image how the Holy Spirit gives light & insight to the things of God, lighting the darkness of our minds so that we might have understanding & become obedient children. Lastly this is a festival that remembers both the desecration of the temple & it’s cleansing & rededication. For us, as New Testament believers, there is only one temple. If we are the Temple of God then Hanukkah is a good time to consider how we are functioning as His temple. The Temple was always the place where the people of God went to encounter God: to worship him, to praise Him, to offer sacrifices. That has not changed. If we are now that temple, are we a people of prayer? Are we keeping ourselves free of commercialism & idolatry? Do we make time in our busy day to day lives to have an encounter with the Living God? Do we acknowledge the way He operates in our lives, protecting us, providing for us, giving us ideas & help as we need them? · Do we praise him? Do we praise Him even in the bad times because He has given us a wonderful opportunity to be His living sacrifices; a sacrifice that declares the glory of God always? Do we as Eph 5:19 instructs, us sing and make melody in our heart to the Lord? Or do we only remember to praise Him when everything is going well ~ & maybe not always then? Romans 12: And so, dear brothers and sisters,[a] I plead with you to give your bodies to God because of all he has done for you. Let them be a living and holy sacrifice—the kind he will find acceptable. This is truly the way to worship him. [b] 2 Don’t copy the behaviour and customs of this world, but let God transform you into a new person by changing the way you think. Then you will learn to know God’s will for you, which is good and pleasing and perfect. Remember holy has a specific meaning & simply means to be set apart from the ordinary for the special use of God Himself so we are not to defile the Temple He resides in [our bodies] with sin & disobedience but to completely put ourselves at His disposal. This is the true miracle of Hanukkah: that God gives freely of the living waters of life & the oil of His Spirit never fails but is constantly available to us if we will avail ourselves of it. And because church should also be fun we lit the candles, prayed the blessing, sang a Hanukkah song & ate candy! Blessed are you, oh Lord our God, King of the Universe, who commanded us to live as Children of Light through Jesus our Messiah.